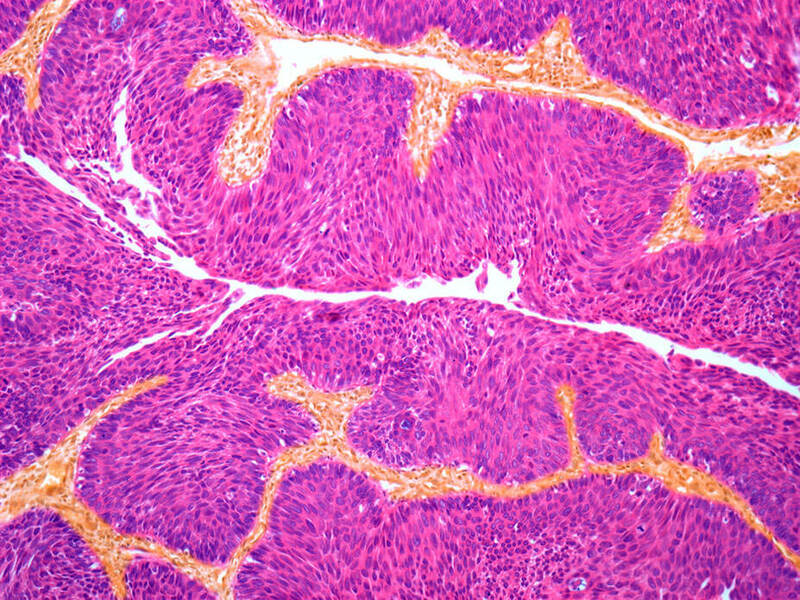 A light micrograph section of urothelial carcinoma, the most common form of bladder cancer. Smoking and working with industrial chemicals may put people at higher risk for this cancer. The bladder, a balloon-like organ that stores urine, can expand when it’s full and contract when it’s empty thanks to special cells lining the urinary tract called urothelial or transitional cells. These cells can turn cancerous in what is known as urothelial carcinoma (UC). UC can also begin in the urinary tract’s tubes – the ureter and urethra – the prostate, and renal pelvis, a central collecting area of the kidneys. But it most often starts in the bladder. Bladder cancer makes up approximately 90 percent of urothelial cancers. Bladder cancer is most prevalent in older people and men. Each year, about 110,500 men and 70,000 women will be diagnosed with bladder cancer worldwide. It is the seventh most common cancer in men worldwide. Unlike other cancers which have few symptoms in the early stages, bladder cancer can often be found early because it can cause blood in the urine. Other signs include frequent or urgent urination, swollen feet, bone pain, pain while urinating, and unexplained weight loss. The five-year survival rate for localized bladder cancer is about 70 percent. But when cancer spreads to distant parts of the body, the 5-year survival rate drops to 5 percent. The cause of bladder cancer is not known, but it’s often linked to environmental factors such as smoking and working with industrial chemicals. Smokers are three times more likely to develop bladder cancer than non-smokers. Workers in the rubber, leather, textile, paint, and printing industries have a higher risk of developing the disease. Painters, mechanics, hair dressers (because of the dyes), and truck drivers (because of diesel fumes) also have a higher risk of developing the disease. Bladder cancers are divided into two subtypes depending on the type of tumor. - A papillary carcinoma is a finger-like tumor that grows from the lining of the bladder into the hollow center. These early tumors are usually non-invasive and do not spread into the deeper layers of the bladder wall. - Flat carcinomas grow flat on the inner lining of the bladder. If these tumors grow deeper into the bladder wall, they are then categorized as muscle invasive urothelial carcinoma. This cancer is harder to treat. Treatment for bladder cancer depends on the stage of the disease. Early stage or superficial bladder cancers can be treated with a procedure known as Transurethral Resection of Bladder Tumor (TURBT). A scope, fitted with a wire loop that removes any tumors, is inserted through the urethra to the bladder. Invasive bladder cancer is often treated with a cystectomy, where all or part of the bladder is removed. After surgery, patients are treated with a variety of therapies to prevent the cancer from returning, including radiation, chemotherapy, and most recently immunotherapy. The goal of treatment for metastatic disease is to prolong survival and maintain or improve quality of life through symptom reduction. Initial treatment has generally been platinum-based combination chemotherapy. Options for second-line therapy have been limited, but now include immune checkpoint inhibitors, as well as chemoradiation, radiation therapy and clinical trials.